I have friends who would do their end of year juice detox regime after the holidays to cleanse their bodies. I think juice cleanses are beneficial if you do them correctly. The key to my successful cleanses are blending the right ingredients. I see the differences in how my skin look and how I feel. If you feel great after a juice cleanse, you know your body responded well to the detox but if you feel tired and moody, then it's most likely the juice ingredients you used were not appropriate for your body type. I learned first hand that drinking just raw green vegetables was a bad thing for me. Drinking to much cooling vegetables can weaken your body which can lead to digestive problems and loose stool. I've seen juice cleanse recipes that are just a mixture of disaster for normal and healthy people. For instance, a recent recipe I came across contained kale, cucumber, lettuce and some more greens. I think all green juice cleanse is great for the hot weather but for the winter cold, a warming juice cleanse is more appropriate. 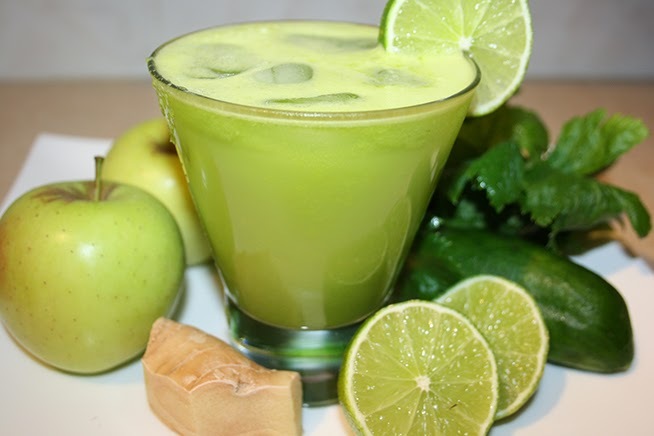 Green ginger ale from The Kitchen Rebooth is an awesome warm winter juice. Rather than drinking can ginger ale soda, this is a much healthier version without the sugar. Green apples - contains a lot of fiber and vitamin A, B, and C, and minerals such as calcium, iron, magnesium, iron, potassium, copper and zinc; consists of antioxidants such as quercetin which helps boost the immune system, polypheol and flavonoid help in reducing the risk of cancer by not allowing DNA damage to occur. Celery - reduces inflammation; rich in vitamins B1, B2, B6, and C; helps lower cholesterol. Cucumber - helps flush out toxins, a good source of potassium and contains high amount of vitamin K.
Lime - contains calcium and folate, peel of lime helps combat skin aging, and can help prevent formation of kidney stones; contains limonoid compounds that have been show in studies to prevent colon, stomach and blood cancers. Ginger - contains anti-inflammatory compounds which help reduce pain and inflammation; helps maintain normal blood circulation; a natural expectorant that breaks down and removes mucus - great for respiratory problems such as cough and bronchitis; and strengthens the immune system.